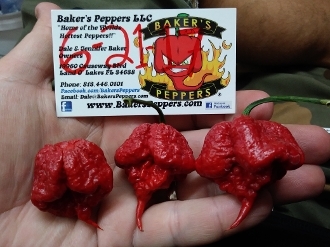 We have packs of seeds available of THE HOTTEST pepper on the PLANET!! The REAPER! These are a SERIOUSLY hot pepper and we sell them in packs of 20+ seeds each. These peppers will mature from green to red and it will be roughly 160 days to harvest! They have a VERY roughly wrinkly, pimply, covered outside and SCORCHING heat on the inside! Try your hand at growing a NUCLEAR hot pepper, one like The REAPER! :) Order yours today!